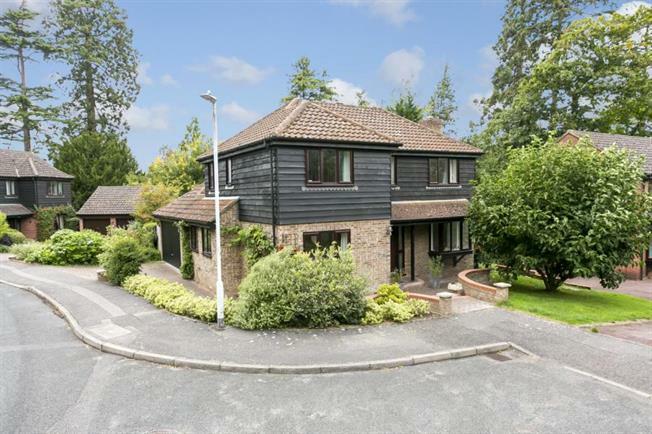 4 Bedroom Detached House For Sale in Tunbridge Wells for Guide Price £635,000. A beautifully presented recently renovated four/five bedroom detached family home, situated in a private cul-de-sac. With a large private rear garden, double garage and driveway. The accommodation is comprised of a double aspect sitting room with French doors leading out onto the rear garden and patio. A large dining room with plenty of space for a large dining table and chairs, a fitted kitchen and separate study. The entrance hall is bright and spacious with stairs leading to a large open landing with three double bedrooms and one single bedroom. The master has a newly fitted en-suite shower room with an Aqualisa waterfall shower. The family bathroom has also benefitted from being re-furbished with Aqualisia bath and shower. The property is situated in a very quiet cul-de-sac on the outskirts of Southborough. The garden is private and mostly laid to lawn and is surrounded by trees with a large paved area leading out from the lounge and kitchen. To the front there is a double driveway with ample parking. The property is situated in a popular residential area, close to Southborough Common and conveniently located for Southborough's shops and local amenities along with access to a good selection of state and independent schools catering for a wide range of age groups. Tunbridge Wells center and High Brooms both have mainline stations offering fast and regular train services to London.